Get “Solitude” on sale for just over a dollar! In celebration of my reaching 50k words and (finally) WINNING at (Camp) NaNoWriMo, I am going to put “Solitude” on sale. 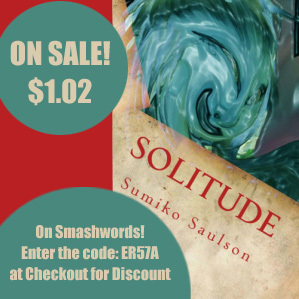 This is the first time I’ve ever put “Solitude” on sale, but since my NaNoWriMo project “Disillusionment” is Part 2 in the Solitude Saga, well, it makes perfect sense. Get it for $1.02 with the coupon code today! When I first heard of Solitude I really liked the idea. The concept of being totally alone is a fear of mine and I was curious as to how each character would react, but there is more to the story then that. Solitude also gets into mythology and the supernatural as you find out why things are the way they are. There is a lot to like about Solitude. One of those things is how the city of San Francisco itself is a character. Even though I’ve never been there , I felt I had been when I was done reading it. Sumiko really did her homework in the writing of this book. Each time there was an isolation as its called in the book, it corresponds to an earthquake that really happened. The book also gets into religion and touches on the subject of how something sinister can effect us on a personal level and how our world can be changed when something wants what we have. One of my favorite scenes in the book was when a spirit takes over one of the character’s bodies and cries as he realizes that another character has died. At this point you are thinking that the spirit is evil and even the person whose body the spirit takes over wonders if the spirit is faking, but you soon find out that the spirit is not what it seems. I also liked the character of Angela who seems to be at the mercy of several external influences. I looked at her as a tragic character, she comes across as evil in the book but she doesn’t try to be, she just reacts to things in her environment the wrong way. If I was to compare Solitude to anything, it would probably be to Stephen King’s The Stand or Beneath The Dome. You can also compare Sumiko’s writing to Anne Rice. The subject matter may not be the same but Anne Rice got into her character’s heads and Sumiko Saulson does the same thing. By the end of the book I felt I knew each character personally and it was hard to see them suffer. I would classify this book as psychological horror. Because Sumiko doesn’t seem satisfied giving you a book that will entertain you and give you a couple of quick scares. No that’s to easy, Sumiko wants to make you think and then give you nightmares. Twice while reading this book I stopped and thought about the ideas that Sumiko was trying to get across, such as being at the mercy of forces greater than yourself and the idea of a world within a world. The tone of the book is a little depressing and I would have liked a couple more action scenes but this is a great read. Definitely a book for those readers who know San Francisco well, Saulson does a great job of weaving in threads from SF’s past history, as well as modern history. The plot starts out with a bang of scattershot impressions of all the major characters as Something Big happens to them- and as you go on, you get to know who these people are and care more and more for them. I’d agree with the comparisons to King’s more epic works: this one’s structured similarly, and paced in much the same way as King’s work. If you’re in the mood for something King-ish, this book can stand up proudly to that comparison. Don’t read this book before going to bed, you’ll never get to sleep! The suspense and attention to character development is impeccable. You get to know and build a personal relationship with them, the story weaves and arch that binds them all together in one unexpected conclusion. READ THIS! You will love this novel. This is a fascinating and epic novel, evocative of Stephen King, especially his more grandiose works such as The Stand and The Dark Tower. It involves a group of people who wake up to find that everyone in San Francisco seems to have disappeared except for themselves, and soon discover that there are great forces at work. The drama unfolds as they discover the nature of their predicament and attempt to resolve it. I love the mystery of the beginning of this novel and how it builds up in sinister intensity in its sheer horror! ~ by Sumiko Saulson on July 29, 2013.